Recent student outrage over racially insensitive acts has sparked some of the largest protests in Cal Poly’s history. These protests not only condemned the widely circulated photo of Lambda Chi Alpha member Kyler Watkins in blackface, but accused Cal Poly of fostering a culture of racism. 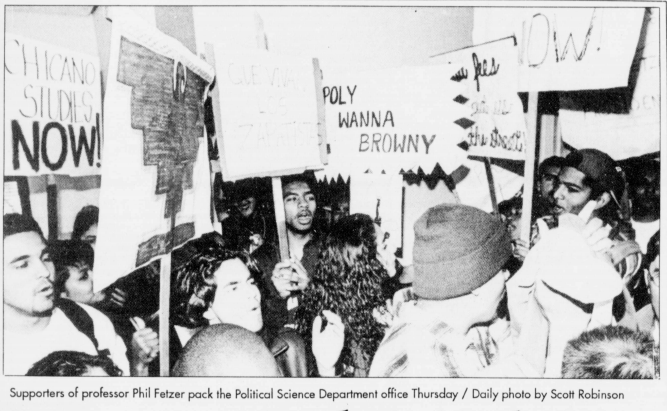 Cal Poly’s student body is not typically known for social activism; protests throughout Cal Poly’s history are few in number and small in size. Not all professors believe activism is on the rise. Timothy Barnes, a history professor who has taught at Cal Poly since 1969, has seen little growth in activism. The recent protests did impress the professor, however. Maggie Cox, a sociology sophomore who participated in recent protests, thinks Cal Poly’s culture needs to change for student activism to increase in the future. Below is a timeline highlighting protests and demonstrations at Cal Poly during the past 58 years. This is not an exhaustive list.